Naso vlamingii in Mabul, Malaysia. 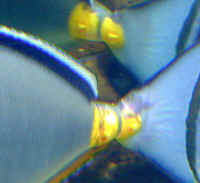 Naso tang Hello, I recently added a lipstick tang to a 100 gallon tank..<did you quarantine this fish for 3-4 weeks> All usual tests were fine... the tank houses 2 Percula clowns and two blue damsels who are all fine. 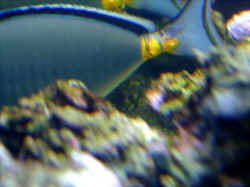 <ok> After about five hours in the tank the tang simply wanted to rest on the bottom and not move. <usually they rest on the bottom when first introduced> After about twelve hours he was on his side..<did you acclimate him properly?> Still alive but not wanting to move. 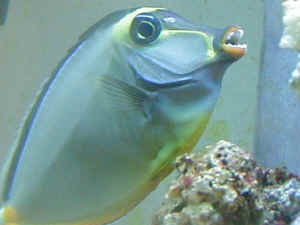 If prompted by the movement of a fish near by he would swim around a bit but always return to somewhere on the bottom. He died in about 24 hours from being introduced into the tank.<That is why it is good to quarantine fish before introduction to the main system> The tang had been at the shop for at least two weeks and was very healthy looking. swimming great and eating fine. Any idea what I did wrong? <could be how you acclimated it, but from now on I would quarantine all fish for 3-4 weeks before introduction> One suggestion was that my oxygen content was too low. I purchased a test kit today and measured between five and seven (which does seem low by some reckonings. )<well these free open swimming tangs require high levels of dissolved oxygen> Could this have effected a larger fish in this way, but still have supported the smaller damsels? <yes, it could have> I feel very guilty for losing such a fine fish, and would like to establish what I did wrong before trying another one. <good idea> The tank contains only fish and has been established for 3 months. I use natural seawater (live on an island)<would use pre-mixed salt-such as instant ocean.. etc> and maintain gravity at 1.022. I regularly change 10% water and add stress Zyme in proportion to these changes. Temperature is about 79 deg. I also did a copper test today, which reported nothing present.<well look over WWM and make sure to quarantine all fish before introduction to your main aquarium, I have enclosed a link for you to look over...should help http://www.wetwebmedia.com/naso.htm> Many thanks<IanB> Brendan Bougourd. Re: sick tang Hello! 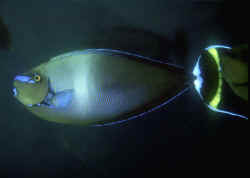 <Hi there> Our Naso Tang has not been acting like himself the last couple of days. He does not beg for food, or come up to the front of the tank when we come in the room. He has not been very active, as well. Today I noticed a discoloration on his tail juncture (where the tail spines(?) are located). The only way I can think to describe it is that it looks like someone spilled ink on the spot. <Agree with your apt description> I've attached 2 pictures - they are not very good, but hope that it will help you in diagnosing the problem. My first instinct tells me to put him in the quarantine tank with antibiotics - agree? <Actually... I would leave this fish where it is (in the main/display tank) and boost its immune system via food (vitamin, HUFA soaking). Bob Fenner> Thanks is advance!